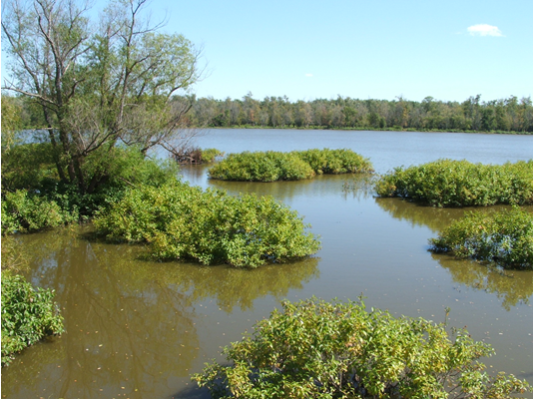 The 225-acre sanctuary is adjacent to the city of Chillicothe and contains high quality examples of wetland, swamp and floodplain forest habitat. The original purchase was completed by Ducks Unlimited in 2012 with assistance from private donors and grants from Grand Victoria Foundation and Illinois Clean Energy Community Foundation. It was donated to the Illinois Audubon Society in August 2018. The property includes approximately 1 mile of frontage on the Illinois River and approximately ¼ mile of lower Senachwine Creek at its confluence with the river. The area has been identified as a Conservation Opportunity Area in the Illinois Wildlife Action Plan (IWAP) and is a conservation priority in the US Fish & Wildlife Service’s North American Waterfowl Management Plan. A total of 152 bird species have been identified at the site including many IWAP species of conservation concern. These include American black duck, great egret, lesser scaup, canvasback, brown creeper, northern harrier, marsh wren, yellow-billed cuckoo, northern flicker, bald eagle, wood thrush, yellow-breasted chat, short-billed dowitcher, hooded merganser, Connecticut warbler, Kentucky warbler, osprey, pied-billed grebe, prothonotary warbler, brown thrasher, greater yellowlegs and blue-winged warbler. Two of these species—the northern harrier and osprey—are state listed endangered species. The protection of Chillicothe Bottoms is part of a broader effort to protect and restore the Middle Illinois River. Illinois Audubon Society has enlisted Peoria Audubon Society as the lead in overseeing management, providing stewardship and expanding future public use of the property.